Good morning everyone. I was at the Dollar Tree the other day when I happened on these little tins. They were cute but the colors were all wrong and they were pretty plain - I almost passed them by. Then an idea struck and I knew I could alter them to make them really trendy and fit into our present decor. So I bought these plain little tins to work a little magic on. Now you all know me by now - I love to put paint on most everything. Nothing is sacred - if I like it and can change it to look more like what I want - I go for it. These little tins needed a makeover for sure. You can't tell much but the dark ones are actually a deep purple. The first one I did was the the little purple bucket on the left. What do you think? 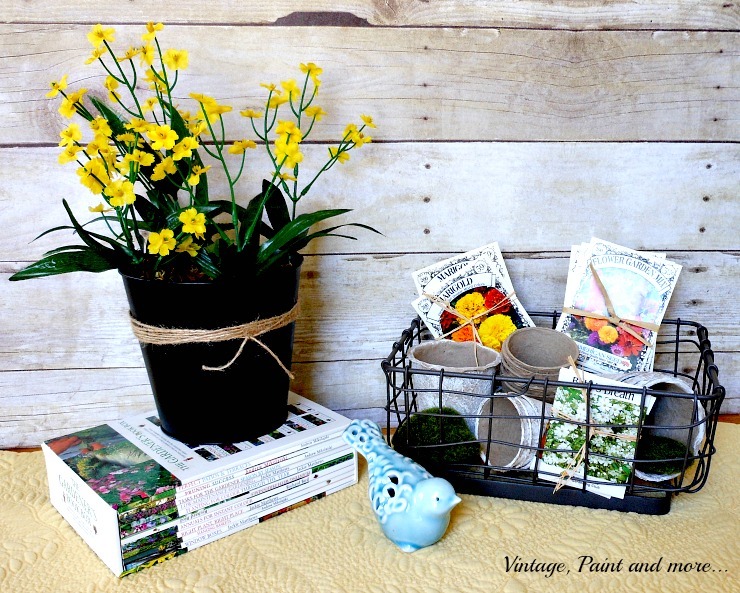 A little paint, some twine and wallah - you have a trendy little bucket that sells for way more than $1 in a home decor store. I used black chalkboard paint and applied it inside and out, then added a bit of twine. I filled it with some moss and "faux" spring flowers. Placing it on a stack of books gives it some height to set it off from the wire basket that is filled with peat pots (some of which I painted white) and some flower seed packets tied with bits of raffia. A little blue bird finishes out this vignette nicely. Next is the short little round bucket. 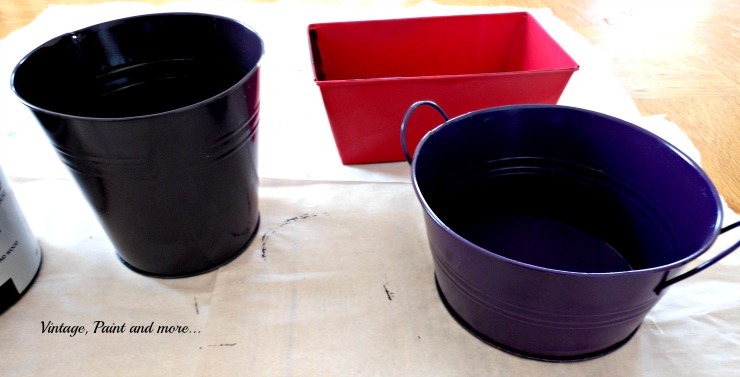 I did the same thing to it - a little black chalkboard paint, some twine and wallah you have a trendy little bucket. I filled it with moss and some painted wooden eggs. Then set it on a stack of old books sans covers. 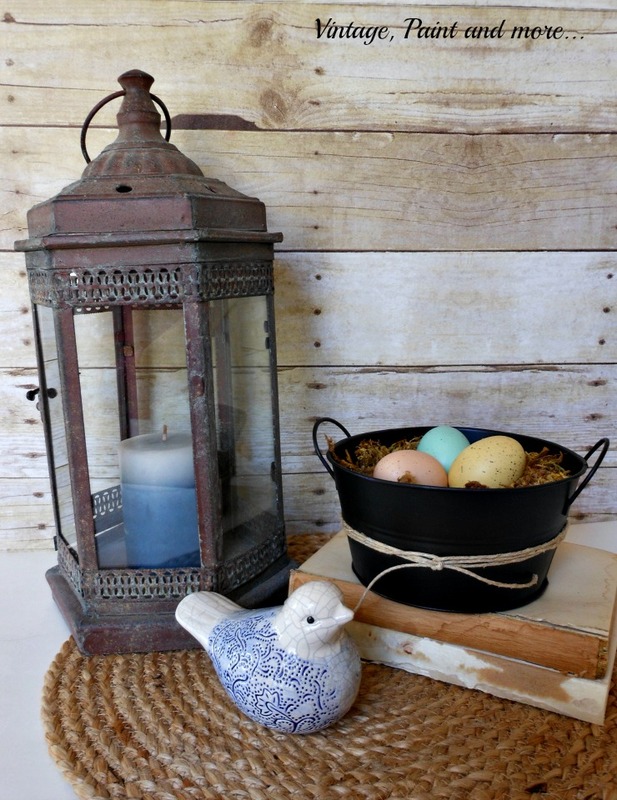 A rusty old lantern with a blue candle and another little bird finish out this cute little vignette. Now the hot pink one got a big transformation. A few coats of black chalkboard paint, a band of drop cloth fabric with a black check ribbon and a DIY drop cloth fabric flower. I added some wrapped Easter eggs I will be doing a tutorial on later. 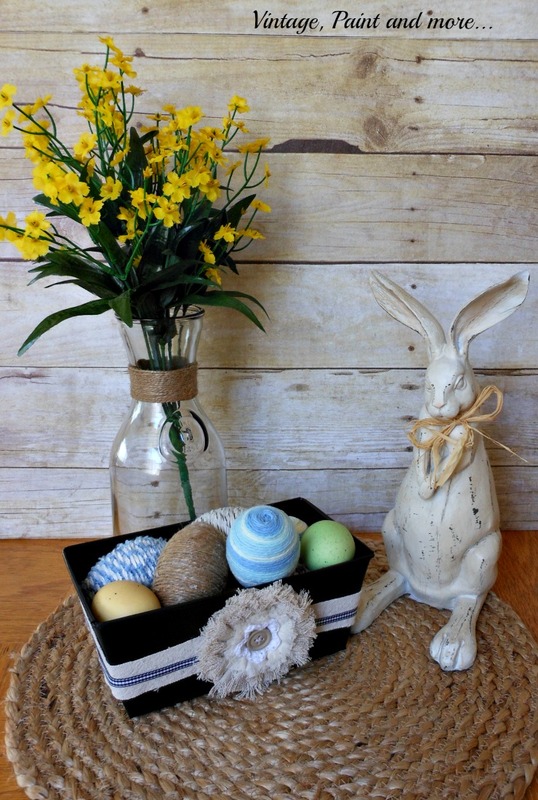 A chippy white wood bunny and a vintage milk bottle tied with twine, holding some "faux" spring flowers and you have another cute little Spring vignette. 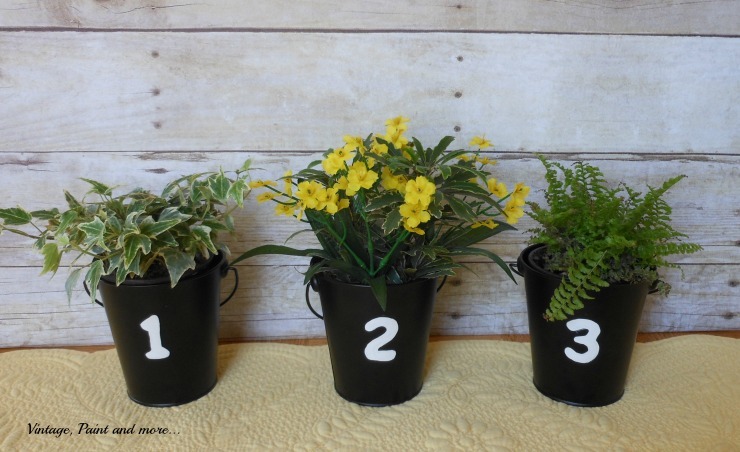 And we can't forget these little buckets I shared with you in the Spring Entry I did last week. They were already black I just added a little white stenciled number to each one to give them a little pizazz. So for about $6 and a little bit of paint and twine I had on hand I got 6 really cute and trendy little additions to our Spring decor. Such a simple project. What have you altered to fit your decor lately? Would love to hear about it in the comments below. Want to make sure you don't miss a thing - sign up for our emails in the Hello bar at the top of this post. Until next time have fun creating something you enjoy. I will be linking up to the parties listed on the Where I Party page. 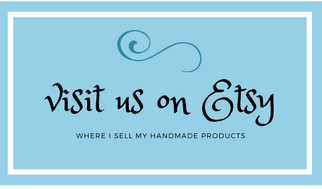 Please visit them and check out the awesome creativeness and inspiration found there. Great transformations! I love how something simple can turn into something great. I really like those -- they look adorable! These are really nice! Great ideas like this are awesome to see. Thank you for sharing with us at Brag About It! Hope you'll join us again next week! 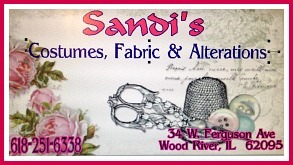 Hi I popped over from Suzannes to admire your handiwork. I love what you did here and can't wait to try this myself! Thank you for the inspiration! So pretty! And chalkboard paint is the best! Great upcycle! I don't have bright colors in my home but the black with twine would fit perfect! Thanks for sharing on Something To Talk About Link Party! So adorable! I am a big fan of paint around here too! You certainly know how to work magic Cathy! All are super cute! Thanks for sharing with SYC.